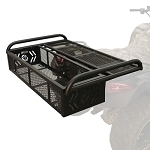 ATV racks or baskets are an excellent accessory for any ATV. ATV racks allow you to bring your extra tools and gear along without having to worry about them falling off your rack. 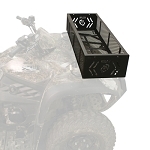 Most factory ATV racks don't have walls around the edges so your ATV gear is likely to bounce off. We carry flat basket type racks or racks designed to carry shovels and rifles. 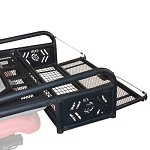 Whether your ATV is used for hunting or around the ranch we are sure our ATV racks will make your job a lot easier. Our ATV racks and other ATV Accessories generally ship out within 1 business day. We offer free shipping on any order over $100.